The online discount is valid on weekdays, excluding national holidays. Splashtours offers a city tour of Rotterdam unlike any other. A tour in the unique amphibian bus is an unforgettable experience for young and old alike!ng en oud! Met Splashtours zie je tijdens de stadsrit de meest bijzondere en mooiste plekjes van Rotterdam. Dan komt de ‘splash’: de spectaculaire duik in de Maas. De bus blijkt ineens ook een zeewaardige boot, die verder door het water langs de spectaculaire skyline van de stad vaart! Een stadstour met Splashtours Rotterdam duurt 60 minuten. 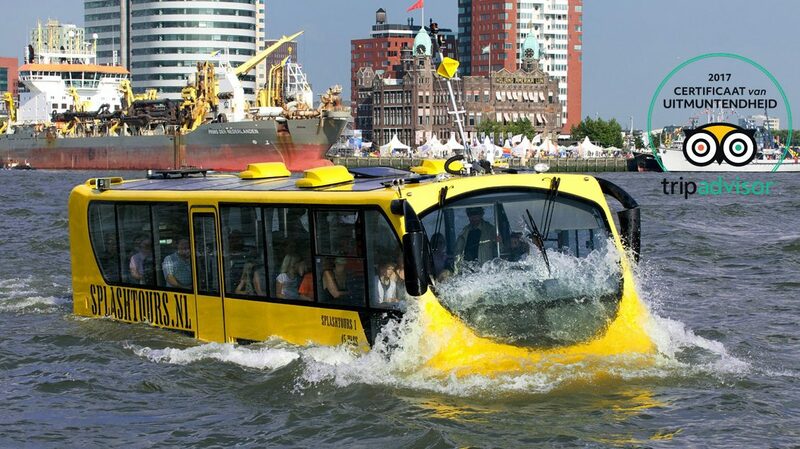 The Rotterdam skyline would no longer be complete without a bright yellow amphibious bus. Whether you see it sailing by the cube houses, or on the Maas River: Splashtours is at home in Rotterdam. The image of the sailing bus has become familiar to the citizens of Rotterdam. But tourists and day trippers can hardly believe their eyes when they see the amphibious bus pass by. Splashtours passengers are wildly enthusiastic. The amphibious tour is popular. Ticket sales took off right from the start, and to this day, every Splashtours bus departs for its tour fully booked. Rotterdam is colorful! In the bus is a GPS data tracking which alow us to provide you information about the buildings, ports and sights. This is done in Dutch and English. For more information about the route, please check the Route page. The Splashtours-bus departs from the Parkhaven, opposite the Euromast (Navigational address: Parkhaven 9). Accross the schip ‘De Zwarte Zwaan’ guest can get in and out of the bus. The Parkhaven can be easaly reach by public transport and there are enough (paid) parking places available. For more information about our location check the ‘Point of departure‘ page.